C Clear Partners > Business > We are a Salesforce Platinum Partner! We are a Salesforce Platinum Partner! Only a year after our promotion as Gold partner, C-Clear Partners joined the select club of platinum partners within the Benelux region. We are grateful and thank our existing- and new customers for their trust in us, our expertise and our consultants. 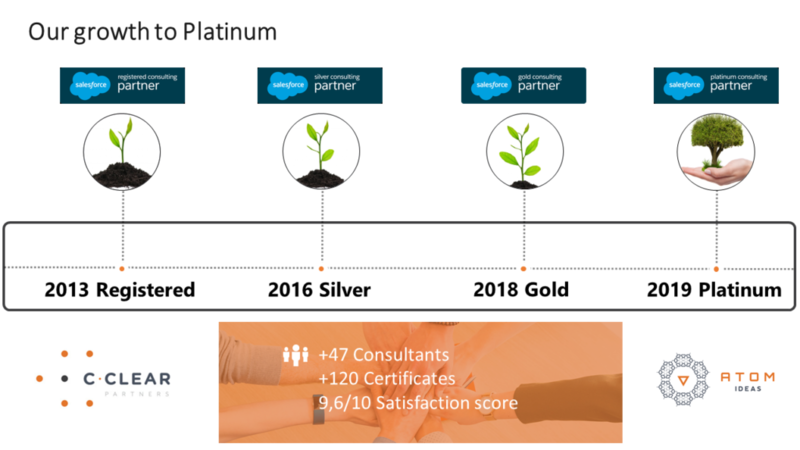 The trust of our customers in C-Clear Partners kept on growing of which we got rewarded by Salesforce in becoming an official Silver partner in 2016. By the end of 2018, we officially became a Gold partner and only a year later a Platinum partner. Our team of more than +45 certified consultants who hold over +120 certificates keep on shaping, creating, managing and guiding our customers towards their success.